On our camping trip last weekend at Kalaloch on the Washington coast we explored some amazing tide pools. They were filled with anemones, starfish and barnacles. 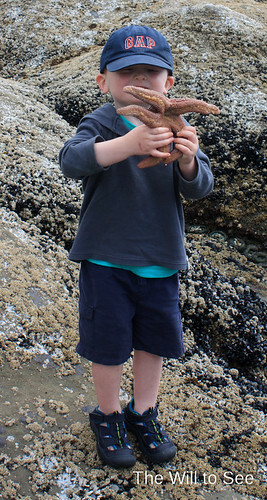 Allison actually found a starfish that wasn’t attacked to a rock and Will got to hold it. He thought it was really cool and like watching the tentacles move. We found him a good place in the water after Will was finished talking to him.